A resource of teaching related articles. STEAM, Global Studies and Leadership. Joy and passion light up the academic experience at Flintridge Prep, where teaching and learning lie at the heart of a full day. Classes are serious but not too serious, with the best moments arriving when play and dedication intersect. Kind humor arises often among teachers and students, and it is rare that a class period goes by without a shared laugh. Teachers exude intellectual passion and express it through a variety of approaches to learning. 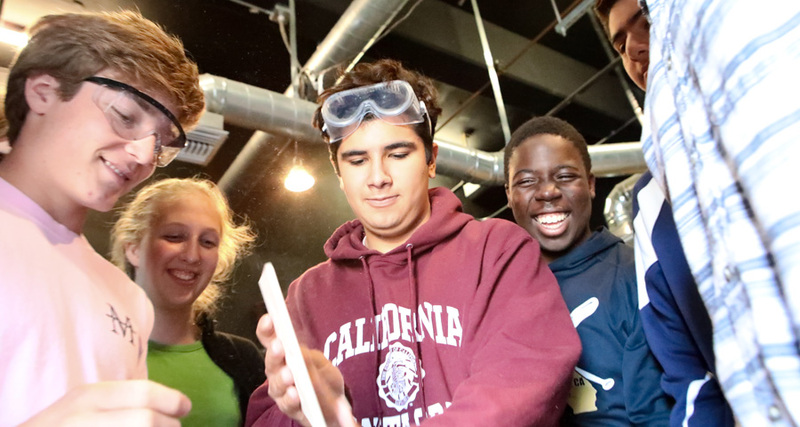 Flintridge Prep recently participated in a series of nationwide surveys of student engagement sponsored by the National Association of Independent Schools. The surveys have shown that Prep students find class discussions and debates, as well as projects that ask groups to imagine far-reaching solutions to real-world issues, particularly engaging. Conversation—formal or informal, inside or outside of class, focused or lighthearted—drives the course of our day. Prep’s curriculum prepares students not simply for the demands of college but also for the fullness of a well-lived life. Students gain grounding in the foundational skills of writing across disciplines, scientific inquiry, mathematical problem-solving, literary interpretation, cultural analysis, historical thinking and world language fluency. We believe in a healthy mind in a healthy body, with an innovative physical education curriculum and an athletics program committed to human development. The visual and performing arts also permeate the campus, whether in a library ceramics exhibition or the expansive all-school musical, asking students to consider art’s potential to change paradigms and perspectives. Outside the classroom, students pursue intellectual passions through our wide range of clubs, including robotics and speech and debate. Ultimately, a Prep education prepares students to be citizens of the world around them, whether that means traveling to Nicaragua to partner with a local school, calculating elliptical cross-sections for a national math exam, or measuring the water quality of a local stream. We also incubate a culture of creative ideas. Teachers have ample opportunities for professional growth, both on- and off-campus, and regularly share exciting ideas from these experiences with colleagues and students. The culture of collaboration among faculty means that it is common for an art teacher to coordinate a project with an English or computer science teacher, or for faculty to be guest speakers in each other's classes. Students have a strong voice on campus, working closely with their peers and teachers on everything from student government to community impact. It is in such creative projects and ventures that we often see the very best of our students, a combination of deep reflection and passionate action. A common sentiment among all ages at Prep is that we feel happy each day walking onto campus: anticipating an inspiring class, a passing conversation, an after-school game or performance. When you walk onto campus, we hope you will experience some of that joy for yourself.